Chances are, this season’s flu has affected you or someone close to you. So why not do what you can and (like your Grandma said) make some chicken soup! This is a GREAT and easy recipe that also includes some extra Basil which has many health benefits. Did you know that both fresh basil and basil oil have strong antibacterial capabilities? Basil also has anti-inflammatory properties! And get this…Parsley has antioxidants, and the vitamin C and vitamin A found in parsley serve to strengthen the body’s immune system. So whip this up today and GET HEALTHIER! In a large pot over medium heat, melt butter. Cook celery until just tender. 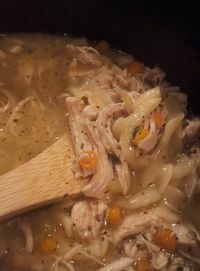 Pour in broth then add chicken, noodles, carrots, onion powder, basil, parsley, salt & pepper. Bring to a boil, then reduce heat and simmer 20 minutes before serving. That’s IT!! Seriously easy!